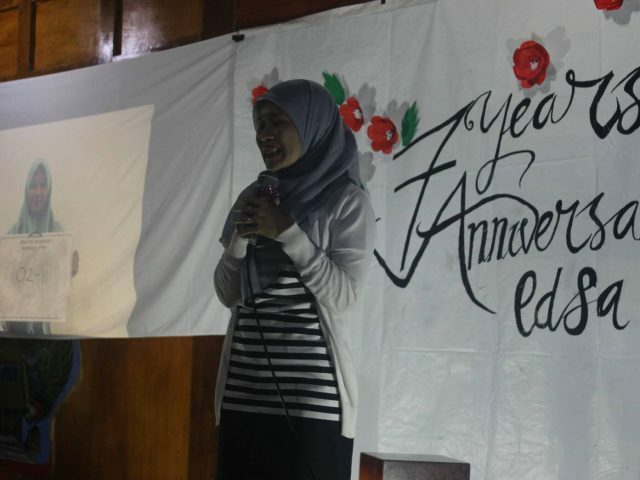 EDSA (English Department Student Association), the student association of English Language Education Department of UMY, had just celebrated its 7th anniversary. As a gratitude and happiness, EDSA celebrated its birthday on November 26th, 2017. The celebration started at 07.00 PM, and finished at 11.00 PM; the party was held at Caping Ndeso, and it was very successful. This celebration was not just attended by EDSA active members, but also the alumni of EDSA. There are around 50 people attended the celebration. The fact that the alumni also attended the party shows that they still feel connected to EDSA, and that EDSA is still in their hearts. The anniversary celebration was officially opened by the head of English Language Education Department, Sri Rejeki Murtiningsih, Ph.D. It was, then, followed by the cutting of the ‘birthday’ cake to mark the celebration of the 7th birthday of EDSA. On that beautiful occasion, EDSA members also had a sharing session about the journey of EDSA, about the history of its establishment, from the previous EDSA board members. Having dinner together and watching some performances from the EDSA board members, alumni, and the lecturers were the next activities. Everyone had a blast day that night.